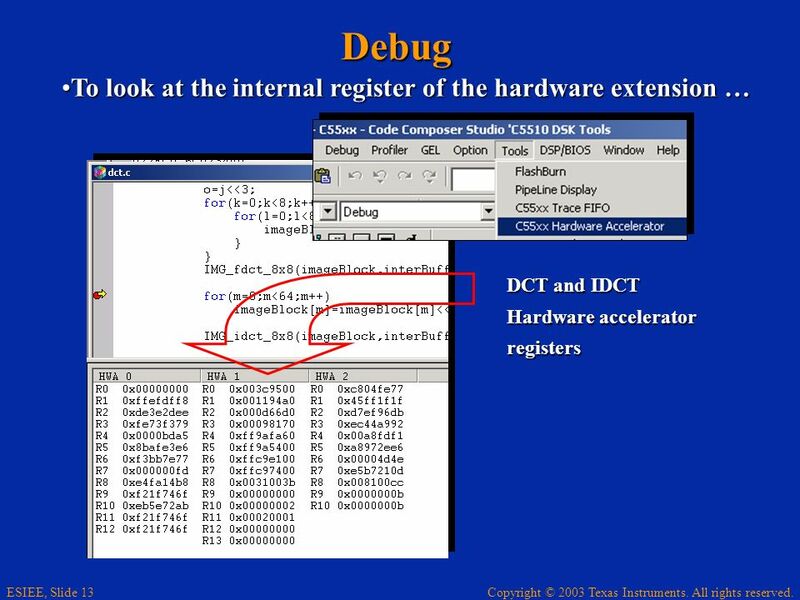 Copyright © 2003 Texas Instruments. All rights reserved. 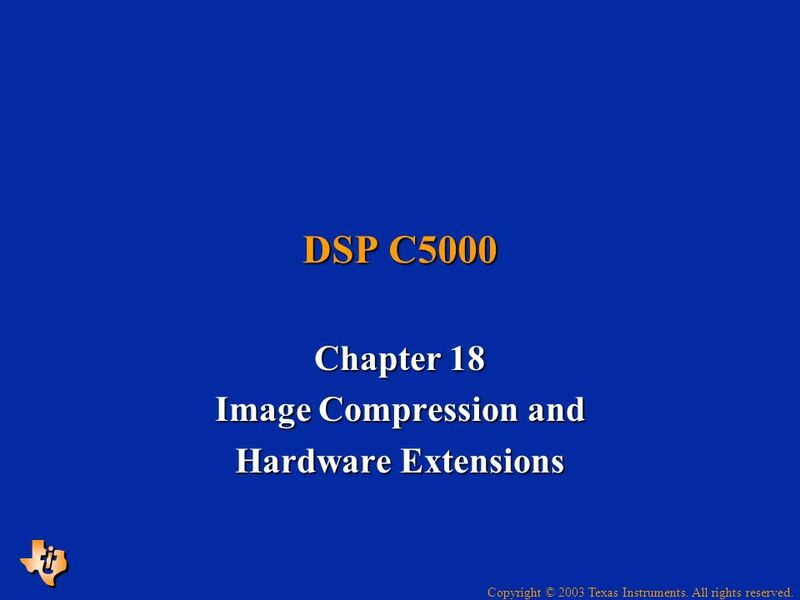 DSP C5000 Chapter 18 Image Compression and Hardware Extensions. 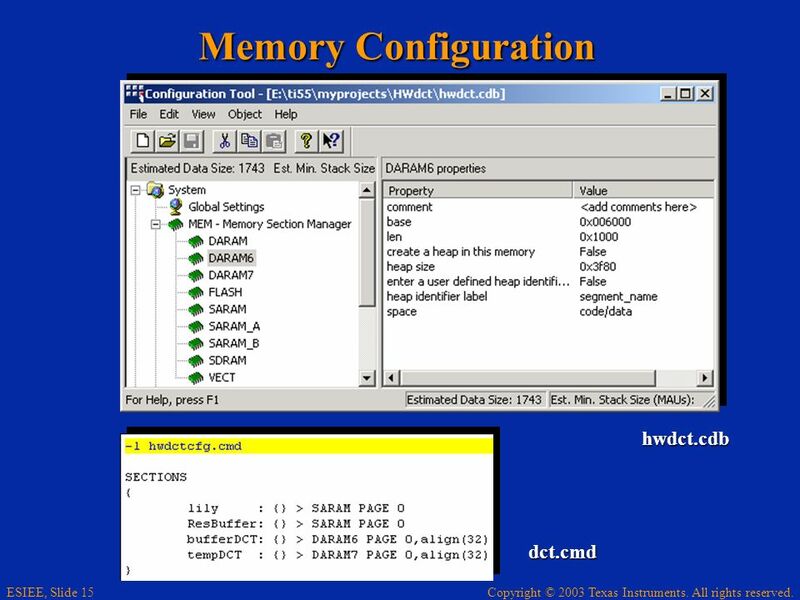 3 Copyright © 2003 Texas Instruments. All rights reserved. 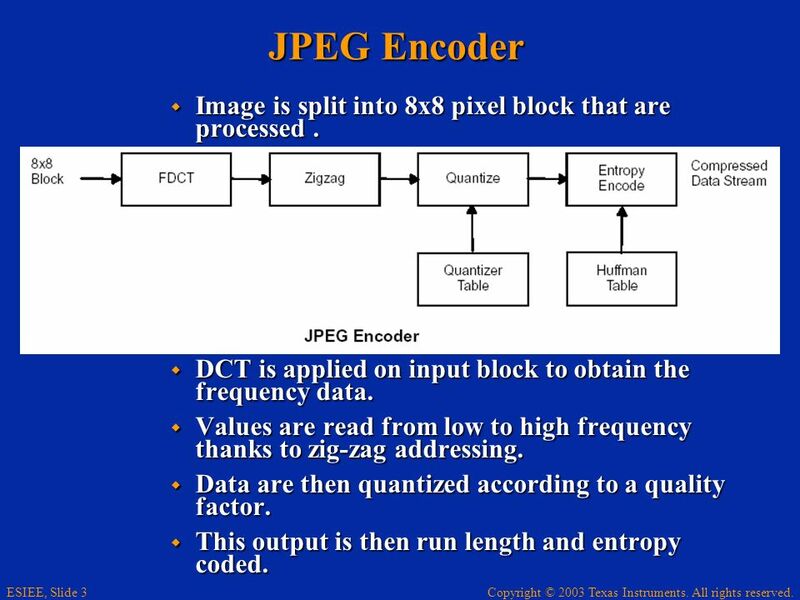 ESIEE, Slide 3 JPEG Encoder Image is split into 8x8 pixel block that are processed. Image is split into 8x8 pixel block that are processed. DCT is applied on input block to obtain the frequency data. DCT is applied on input block to obtain the frequency data. Values are read from low to high frequency thanks to zig-zag addressing. Values are read from low to high frequency thanks to zig-zag addressing. Data are then quantized according to a quality factor. Data are then quantized according to a quality factor. This output is then run length and entropy coded. This output is then run length and entropy coded. 4 Copyright © 2003 Texas Instruments. All rights reserved. 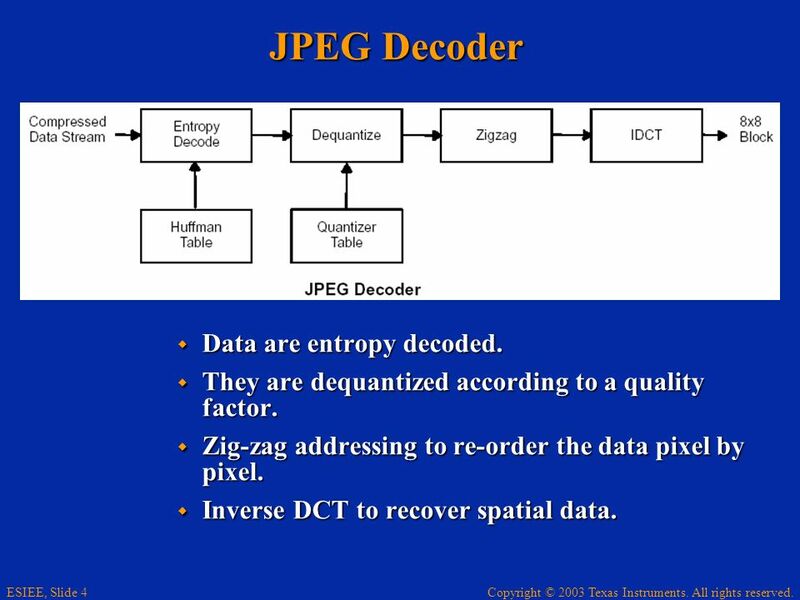 ESIEE, Slide 4 JPEG Decoder Data are entropy decoded. Data are entropy decoded. They are dequantized according to a quality factor. They are dequantized according to a quality factor. Zig-zag addressing to re-order the data pixel by pixel. Zig-zag addressing to re-order the data pixel by pixel. 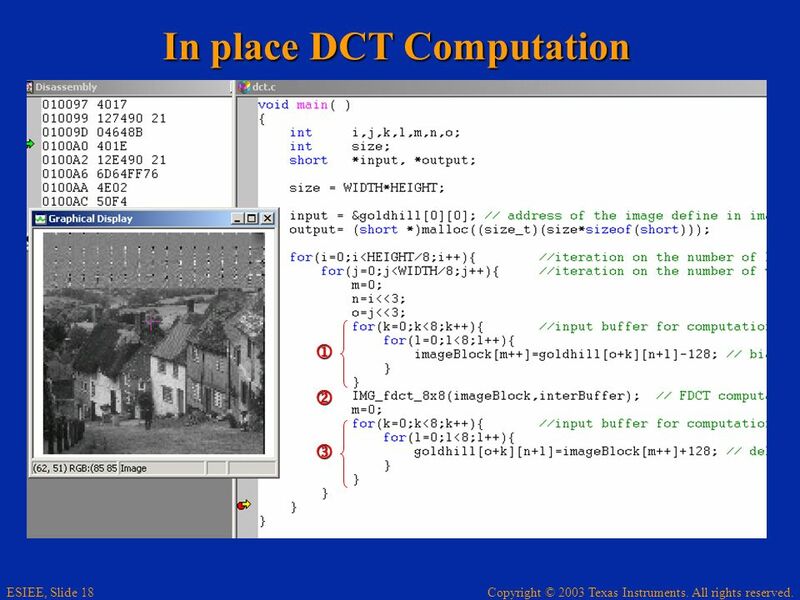 Inverse DCT to recover spatial data. 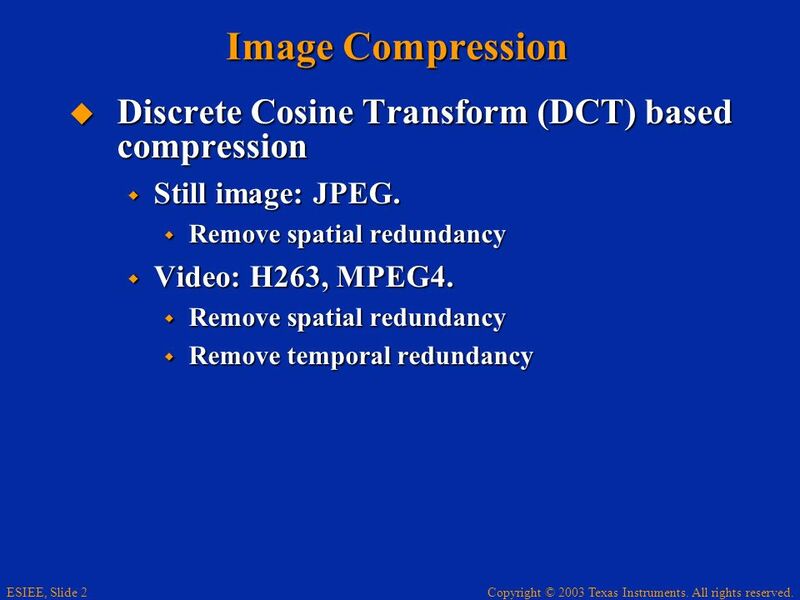 Inverse DCT to recover spatial data. 7 Copyright © 2003 Texas Instruments. All rights reserved. 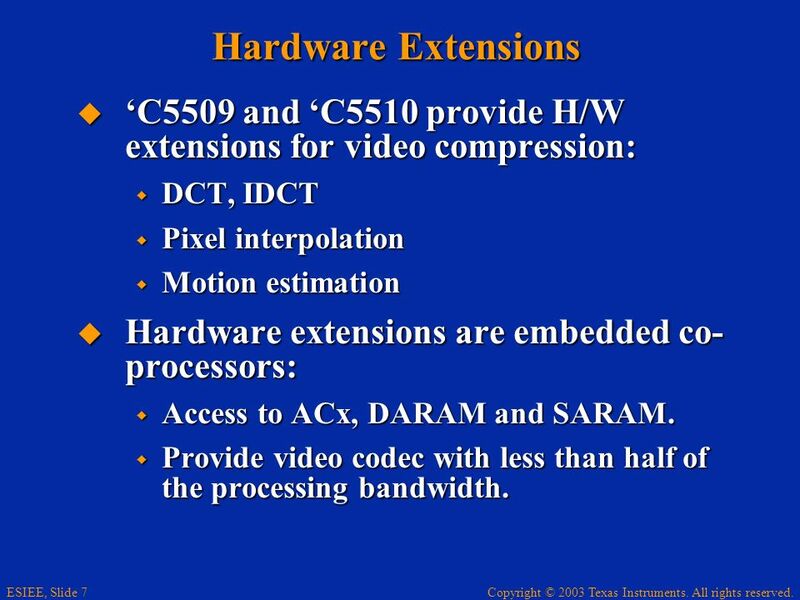 ESIEE, Slide 7 Hardware Extensions C5509 and C5510 provide H/W extensions for video compression: C5509 and C5510 provide H/W extensions for video compression: DCT, IDCT DCT, IDCT Pixel interpolation Pixel interpolation Motion estimation Motion estimation Hardware extensions are embedded co- processors: Hardware extensions are embedded co- processors: Access to ACx, DARAM and SARAM. Access to ACx, DARAM and SARAM. 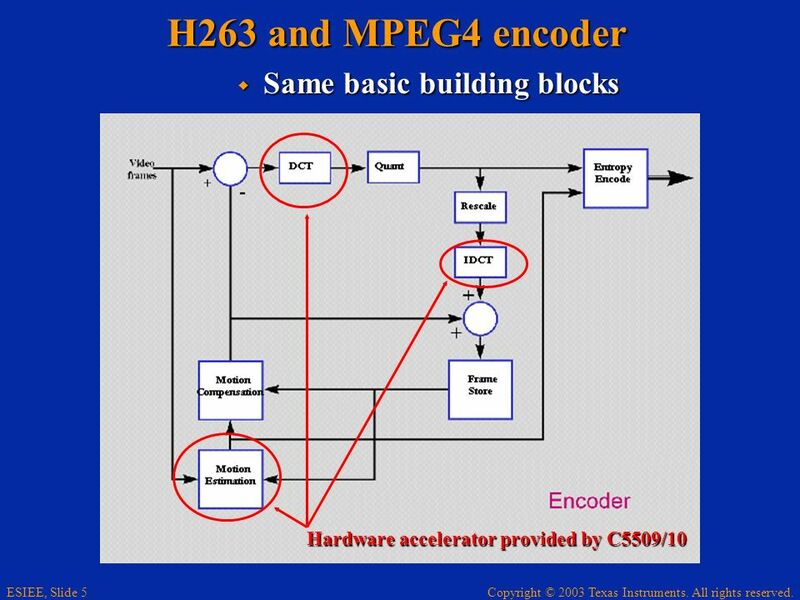 Provide video codec with less than half of the processing bandwidth. 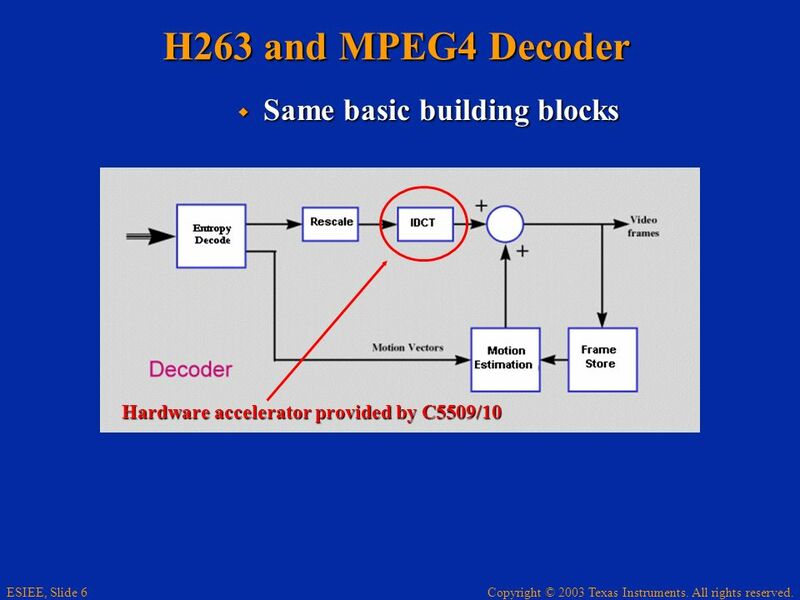 Provide video codec with less than half of the processing bandwidth. 9 Copyright © 2003 Texas Instruments. All rights reserved. 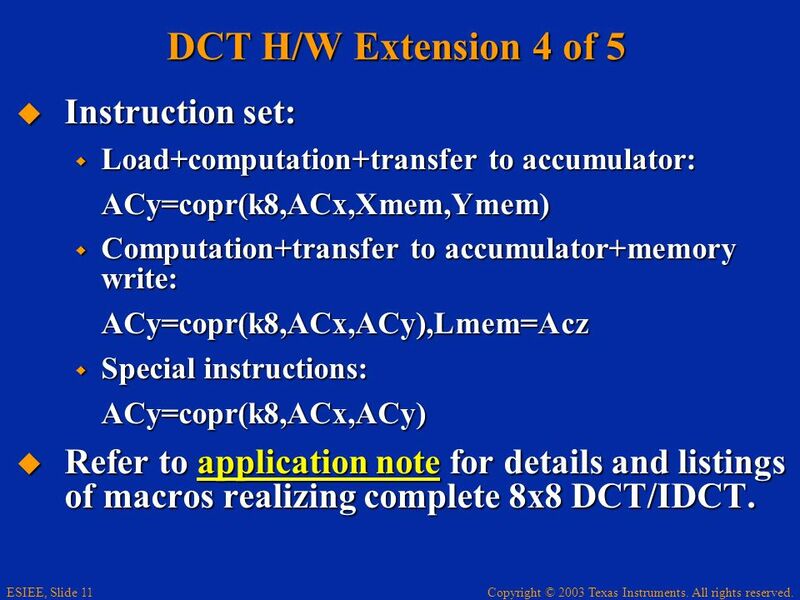 ESIEE, Slide 9 DCT H/W Extension 2 of 5 Basic steps to complete a 2D DCT/IDCT: Basic steps to complete a 2D DCT/IDCT: Input Data: macro block (4x4 or 8x8) is read in (DCT). 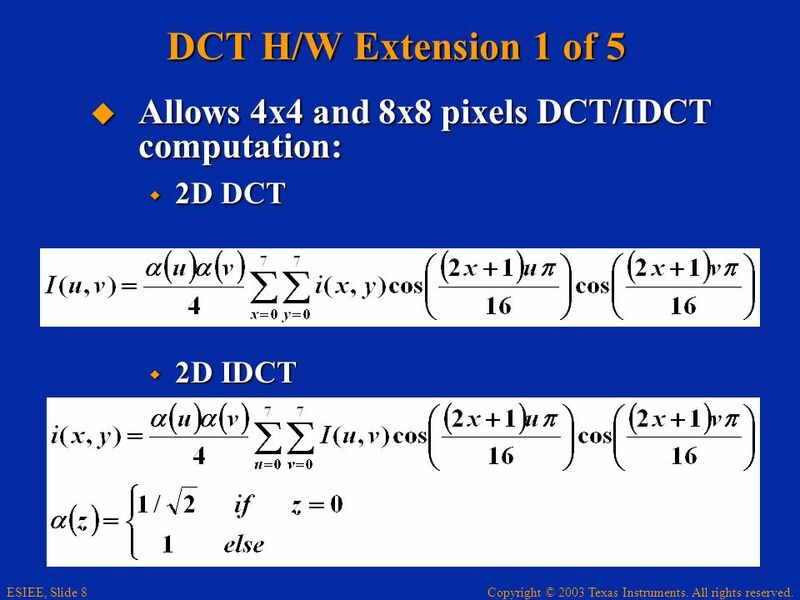 DCT coefficient matrix is read in (IDCT). 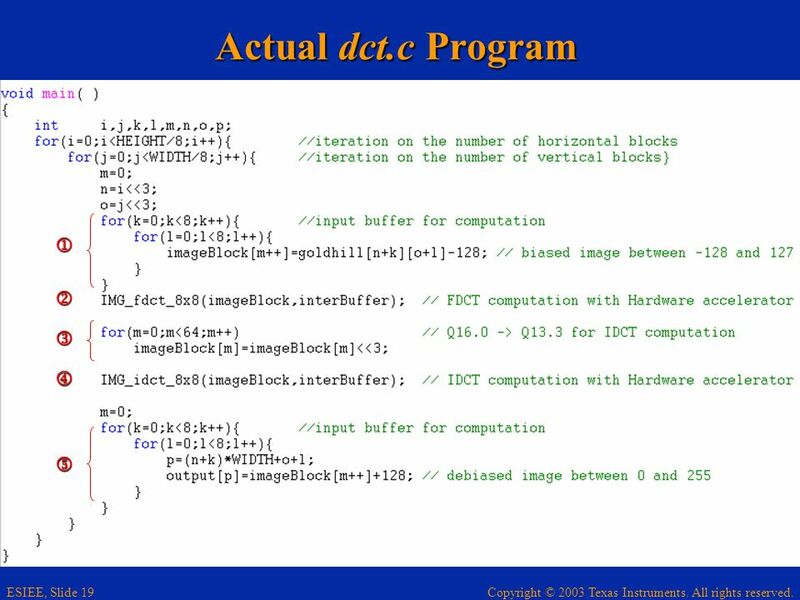 Input Data: macro block (4x4 or 8x8) is read in (DCT). DCT coefficient matrix is read in (IDCT). 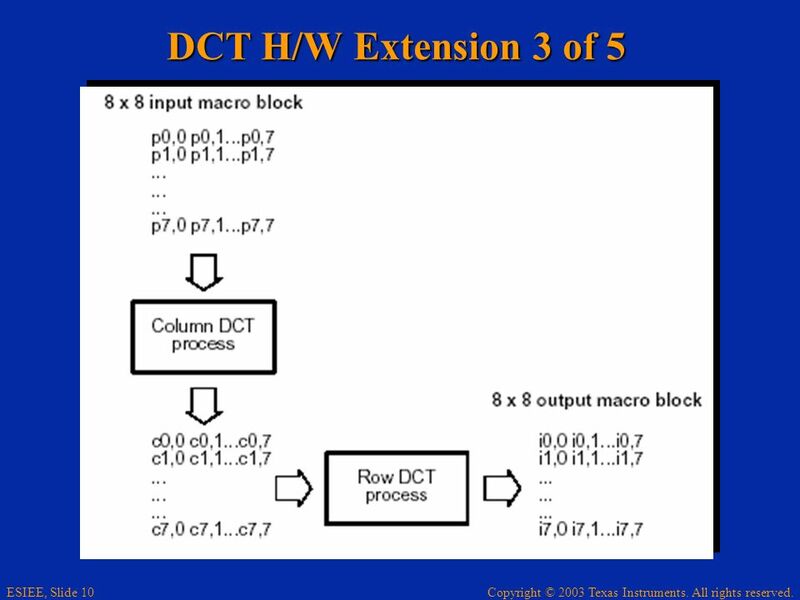 Column DCT/IDCT process: output to temporary registers that will be transposed for Row processing. 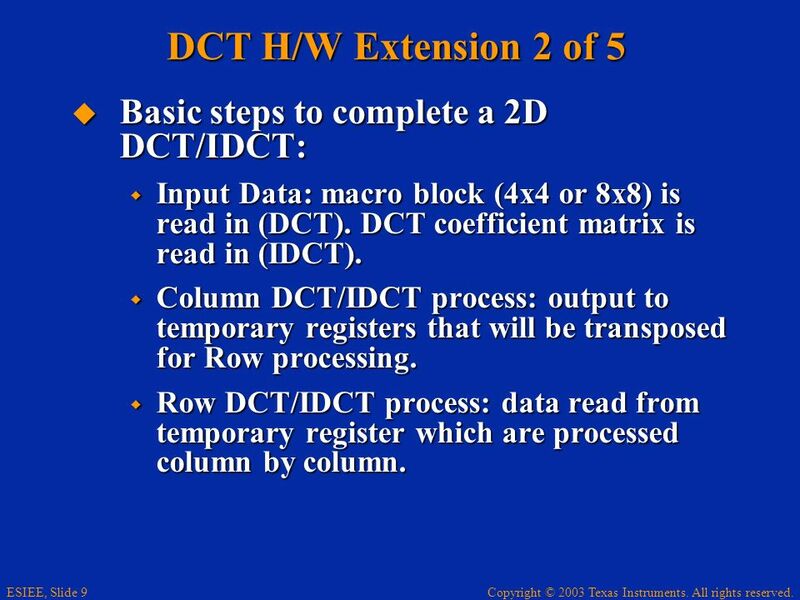 Column DCT/IDCT process: output to temporary registers that will be transposed for Row processing. Row DCT/IDCT process: data read from temporary register which are processed column by column. Row DCT/IDCT process: data read from temporary register which are processed column by column. 14 Copyright © 2003 Texas Instruments. All rights reserved. 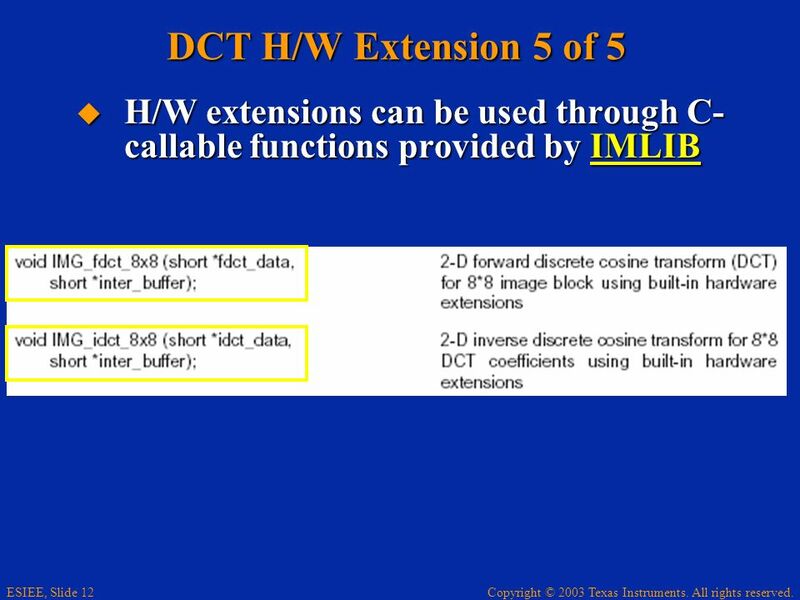 ESIEE, Slide 14 Tutorial DCT/IDCT with IMLIB Describe step by step how to use H/W extensions with IMLIB. Describe step by step how to use H/W extensions with IMLIB. Requires installation of IMLIB before continuing. Requires installation of IMLIB before continuing.IMLIB Requires special memory configuration to obtain optimum performance. Requires special memory configuration to obtain optimum performance. 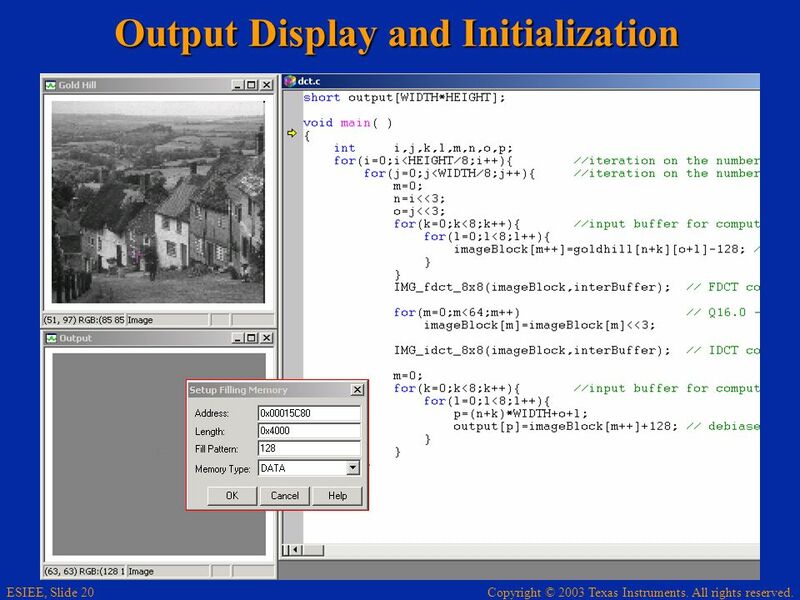 CCS allows display of image contained in DSP memory. 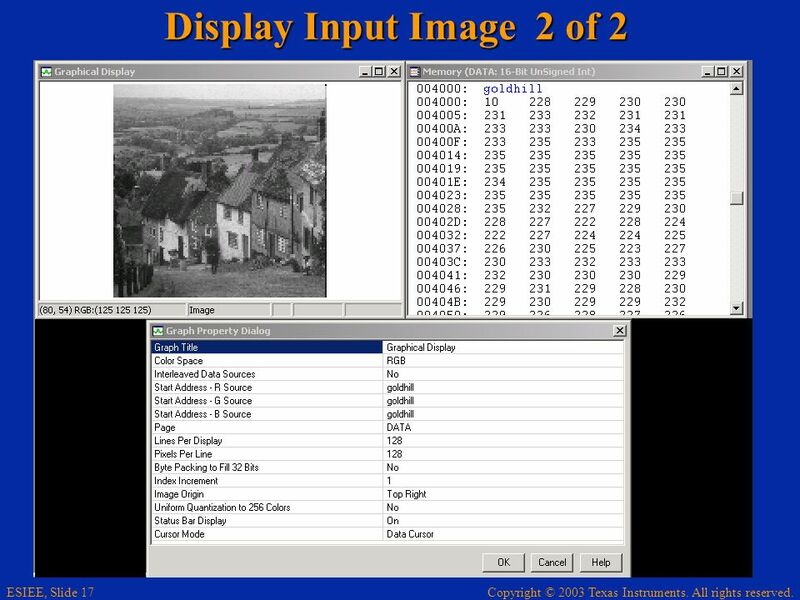 CCS allows display of image contained in DSP memory. 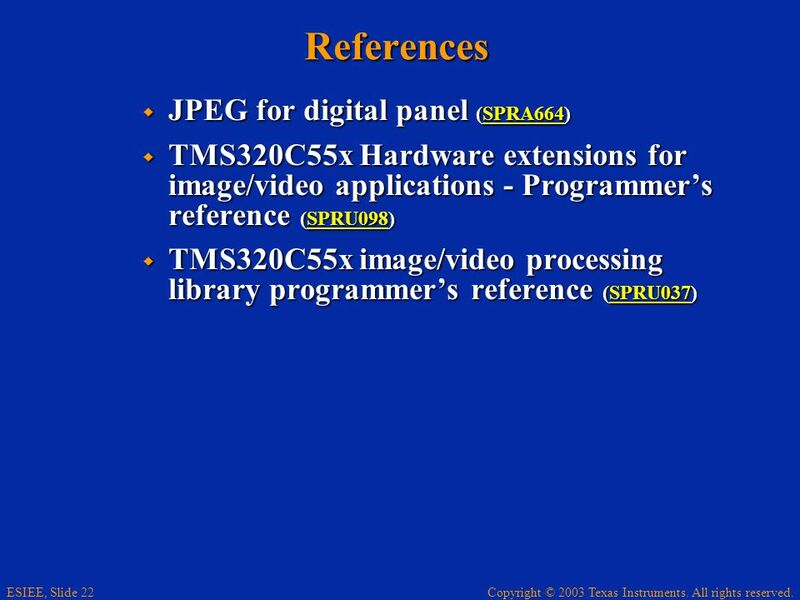 Download ppt "Copyright © 2003 Texas Instruments. All rights reserved. 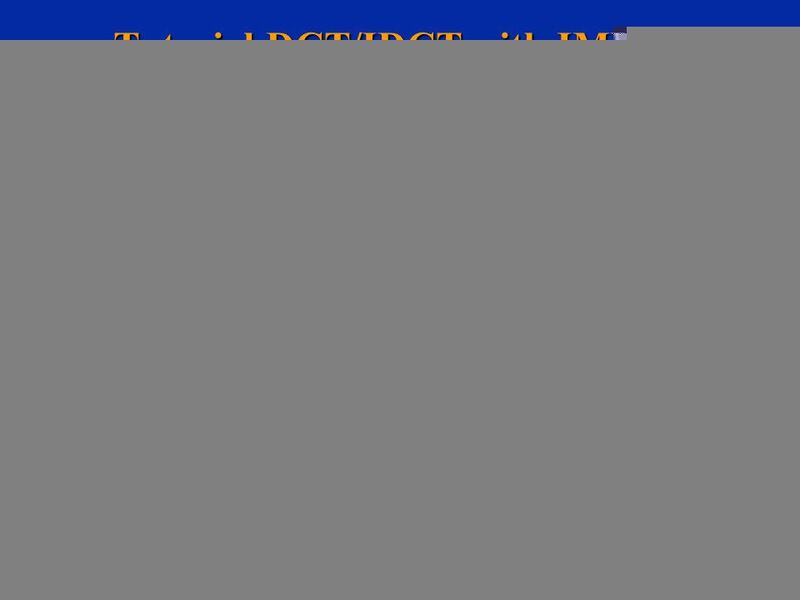 DSP C5000 Chapter 18 Image Compression and Hardware Extensions." 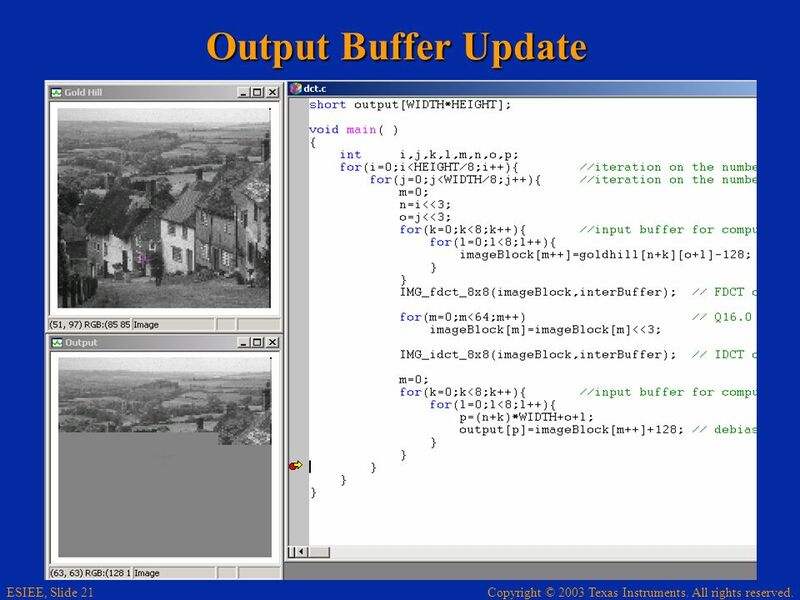 Fakultät für informatik informatik 12 technische universität dortmund Optimizations - Compilation for Embedded Processors - Peter Marwedel TU Dortmund. DSP C5000 Chapter 16 Adaptive Filter Implementation Copyright © 2003 Texas Instruments. All rights reserved. Chapter 14 Companion site for Light and Video Microscopy Author: Wayne. 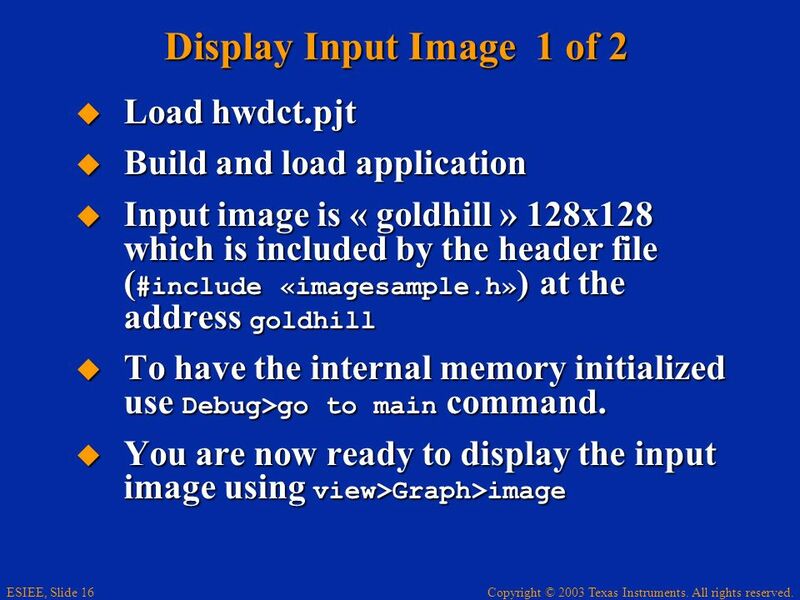 FIGURE 10.1 Graphics Overview.. FIGURE 10.2 Display Pipes.